First, I separate the tomatoes according to color. Fruit which is completely green goes into one group; fruit which exhibits some slight coloring goes into another. Next, the tomatoes are arranged in a single layer in paper bags. I sometimes place a few sheets of newsprint or paper towels on the bottom of each bag (as shown) in order to cushion the fruit. Also, I leave an inch or so of space between each tomato to encourage air circulation. To hasten ripening, an almost-ripe banana is placed in each bag of completely green fruit. The banana contributes ethylene gas, a necessary component of ripening. Tomatoes which are already showing color don’t require this banana-boost; they make their own ethylene. Ripening is also hastened by warmth. In my 65-70 degree kitchen, tomatoes which had already shown signs of color usually turn fully red in their paper bag quarters within 5-7 days. Green fruit, if encouraged by a banana, normally ripens in 14-21 days. Of course, when you ripen fruit indoors in bags, you have to inspect the bags daily. 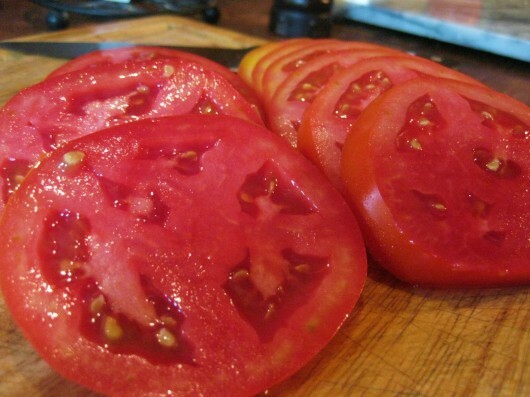 I always remove ripe tomatoes immediately, and use them. Now, if I can’t use your tomatoes at their peak of room-temperature perfection, do what I do, and freeze them in zip-lock bags. There’s no need to blanch or peel them first. Whole frozen tomatoes keep for months, and they are great for making sauce. Can you ripen a tomato on a sunny windowsill? Yes, you can. But it’s a bad idea. Light is neither necessary nor desirable during the ripening process. Not only does sunlight invite rot, but it toughens a tomato’s skin. Darkness, warmth, and naturally-occurring ethylene gas are all a tomato needs to turn from green to red. 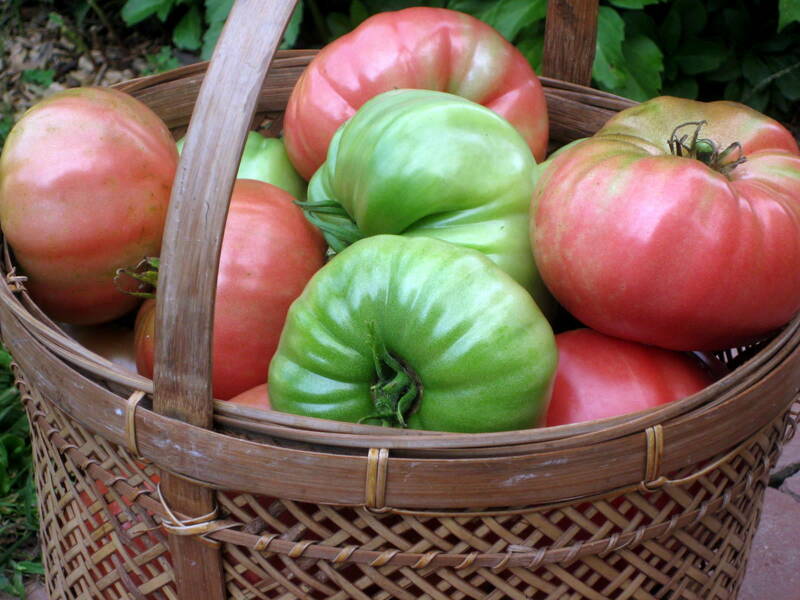 Why wait for chipmunks — or a hurricane — to discover your tasty tomatoes? Pick the fruit while it’s still green, and let it ripen in the safety of your house. Thanks for posting this! I’ve got a lot of green tomatoes out there that don’t want to ripen. I’ll be doing this over the weekend. Hi Karen – Has the weather been extremely hot where you are? Believe it or not, high temps can keep tomatoes from ripening. Good plan to bring the fruit indoors. Wow. I may go out and raid “tomato row” for some green tomatoes. We’re so far behind here this year in my part of the Willamette Valley in Oregon because of our very cold, and VERY wet spring. My tomato plants didn’t go in the ground until early May. Our Sweet Million cherry tomatoes are starting to get ripe, but the Tomosa, Delicious, Cuore di Bue and Legend (which is supposed to be an early tomato) are just loaded with green fruit. And today it’s supposed to be 101. BRB!! Hi Marjean – Willamette Valley is soaring to 101F? What’s this world coming to? Horrid summer here, too — high heat and suffocating humidity. Oy. Yes, temps have been hot here in northwest New Jersey. Thought somehow I was doing something wrong. Thanks for the feedback. Ellen – You’re welcome. Thanks for reading! Hi Kevin- how do you freeze whole tomatoes-just bag them, remove air, and freeze? Sound unbelievably simple (if true)! Julianne – Yes, easy! And no need to express air. When you wish to use the fruit, simply run cold water over a tomato and its skin will slip right off. What great advice! Can’t wait to try this. My main season tomatoes are finally getting ripe. I grabbed a few that were about half ripe and put them in a small box with a banana. Presto Chango!! Two days later I devoured perfectly ripened tomatoes. Took them outside so I could gobble them up while letting the juice run down my arm. Heaven! Thanks for the tip! I used to put my tomatoes in those cardboard flats that fruit comes in. Got them from the grocery store and then covered the tomatoes in newspaper. Then I put them in a cupboard to keep the light out. If you don’t want them to ripen so fast eliminate the banana and you can extend that delicious tomato sandwich season for quite awhile. I didn’t plant tomatoes this year and boy do I miss them. I posted this on Pinterest. this is great info. I’ve done them in bags. My grandmother used to wrap each tomato in newspaper and put them in a drawer. I’ve done it, it works great, but more tedious checking them. Marjean – So glad this method worked out for you. I well know the feeling of tomato juices running down my arms! Jane – Yes, omit the banana for slower ripening. maria – Very sweet of you to “pin” this article. Thank you. patty – True, wrapping each tomato in newspaper works. But what a job! Kevin, I used to have a brother-in-law that would pick his last tomatoes off the vines and wrap them in newspaper to ripen them and he kept them in the basement where it was cool. I don’t think he knew about the banana trick.. Wished he were alive and I could tell him about your idea! The last 5 yrs. my dear in-laws gardened, the squirrels would stand on their hind legs and pick the largest tomatoes it seemed to Mom.. Dad borrowed a trap from next door neighbor and would take them to a wooded area about 1 mile from his house and he swore that same squirrel beat him home and headed for their garden again! One week, he caught and hauled 17 squirrels away then gave up on the idea..
June Green – Glad you enjoyed this tip. Betty819 – Great story. Yes, squirrels LOVE ripe tomatoes. Often they will take a bite from (and consequently ruin!) each and every tomato they can reach. It’s also important to leave the stem on as you have done. This stops the escape of moisture and prevent mold and rotting. My father has been using this technique for 40 years however he uses a ripened red apple with the same results… It stays much fresher in the bag than a banana which has the tendency to get overly ripened and attracts fruit flies if you forget to change it out! Kathy – Thanks for mentioning the stem. Yes, it must be intact. Cindy – I’ve tried this with a ripe apple, too, and although it worked, it worked more slowly than when I used a banana. Maybe a banana gives off more ethylene gas than an apple? Wonderful post! I have brought in tomatoes if too close to the ground or are in danger of being overcome by the forces of nature BUT I use the window method. This is super information and I will follow it to the letter or banana!! I may use the apple instead as I don’t buy many bananas. I did have one grape tomato on the window sill as an experiment, that is not ripening, bet the bag trick will work! Thanks so much! I will not hesitate to bring in my green tomatoes. Thanks for all your great info! Love your site and newsletters! I do the same thing, Kevin. I’ve had too many occasions when I said “I’ll leave that one on the vine one more day”, only to find that the birds had pecked a huge hole in it, the squirrels had pulled it off, took one bite and left it on the ground, or a raccoon or ‘possum had stolen my prize tomato. 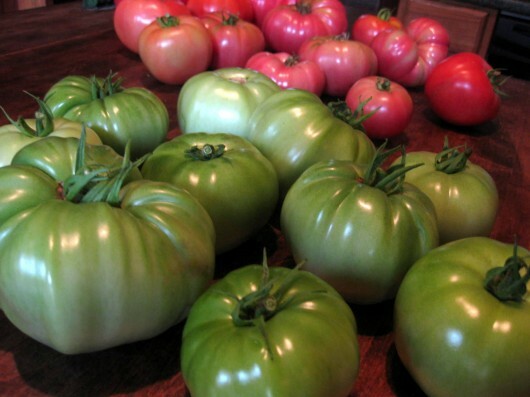 …..and I thought I was the only one with “green tomatoes”. Thanks, Kevin for the insight. I agree with all this except every time I try freezing tomatoes, they taste horrible! I know people say it works, but mine had such an off taste…so I either can my extras or dehydrate them. Very timely! I just rescued 6 green tomatoes from my vines because every other ripening tomatoe had been chewed on by some night invader! Grrrrr! I put mine in either drawers or a cake tin…even without the banana, they ripen up quite nicely…don’t forget to check them though, bruised or cracked fruit tends to rot instead of ripen – but that’s okay, because I put them into a tomato seed recovery jar for next year’s seed. And now I know why my tomatoes quite turning red this summer: Tennessee’s high heat! I didn’t know that. 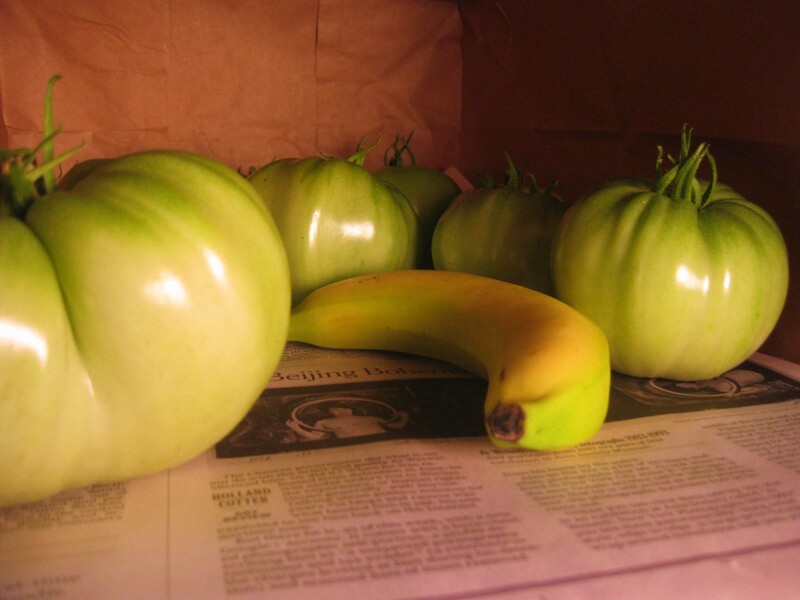 The green tomatoes sat there so long, they ended up getting worms. Next time, I won’t let that happen. Thanks for the tip! Hi Kevin, this is an awesome idea. Are the bags supposed to be open or closed? Cheers. Mary – I keep the bags open. However, it shouldn’t make any difference if the bags are closed. I guess I’m the only one who is skeptical on the flavor on vine ripened vs. picking them green, I may try picking a few green and then having a taste test with vine ripened. I have picked green at the end of the season before but have always thought that vine ripened was best. Do you think you could you use frozen tomatoes in the Tomato Pie? Kay – For me, Tomato Pie is a seasonal item, something to enjoy at the end of summer, when tomatoes are at their peak of perfection. I reserve frozen tomatoes for soups, stews, and sauces. Thanks for the excellent tip Kevin! The chipmunks get our tomatoes as soon as they’re perfect. I nver knew, also, that windowsill/sunlight is not the way to go. Kevin, do you know if will this work to ripen peaches, plums and other fruit? Another tomato gardener from the Wilamette Valley in the beautiful PNW. I’m trying your ripening method right now. Two questions: exactly how do I know when a non-colored tomato is mature enough to pick?, and, I assume the bag needs to be closed to provide darkness/contain the gas? You’re a favorite part of my Sundays, thanks! Thank you for the tip. I’m in GA and we have wind and rain headed our way from the hurricane – no matter where it lands. Any time we’re on the east side of the storm the remnants always come our way. Now I know how to salvage my measly 4 tomatoes before they’re killed by the storm. Hopefully, the vine will survive to bear fruit from the rest of the flowers that were just pollinated. Katherine – I know what you mean. Around here, chipmunks get the ripe, low-growing tomatoes, and squirrels, who can climb my tee-pee trellises — get the “top shelf” fruit! Hi Linda – The method will work for peaches, pears, plums, avocados and canteloupe (not honeydew melon). Hi Laura – To determine if a tomato has reached mature size, let your eyes be your guide. If the fruit looks full size, it probably is. I’ve ripened tomatoes in both closed and not-closed bags — both methods work, although you will trap more ethylene gas in a closed bag. Darlene in North GA – My thoughts are with you and everyone else who is within range of current storm — stay safe! Great tip! Will share with my in-laws who’ve taught me everything I know about gardening! We have always window sill-ripened green toms, and I always thought it messed up the flavor and texture! Thanks, Kevin! Has anyone tried this with cherry tomatoes? Great ideas for tomatoes. Even though we are way out here on the Western edge of our great land, your blog has so many good ideas for us all. We have a large garden to support our community of forty and are on the way to trying to build another one ( once we raise some funds) so we can also give food to other parts of our organization and our neighbors. So glad I stumbled upon Garden for the House! I have not tried to ripen green tomatoes inside except for at the very end of the growing season. This is a very interesting premise! What I have done in the past to protect my ripening fruit from bird-pecks was wrapping them in swatches of tulle fabric (like that used in bridal veils) or wrapping parts of the cage with traditional bird netting. Netting and tulle can be found at yard sales and church sales fairly easily. I have also hung red Christmas balls on rungs of the cages (prior to having any red fruit) which was supposed to untrain the birds from finding a reward by pecking, but instead it seems to frighten them with their own reflection, kind of like a gazing ball effect. This backfired by allowing insect pests more leeway to munch away, since birds were wary of the Christmas balls and decided not to help me out with pest control. When a bird does peck a hole in a large fruit, I lay it at the base of the plant hoping to make it easier for the bird to get a second taste and maybe other fruits will be spared. Chipmunks are a factor, here, too. Netting makes it harder for them to gnaw on the ripening fruits. And it works against tomato hornworms as well. Squirrels and groundhogs (which also climb trees, fences and tomato cages) are not a factor because of my excellent canine huntress, Jasmine the Wonder Dog. I remember reading a study last year that storing tomatoes with the stem side down kept them from rotting longer than right side up. Just another tip for keep the goodness going! Never knew that window ripening toughened the skin, will stop that immediately! 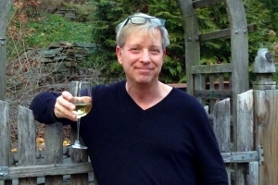 Love your blog, Kevin, Thanks! Thanks for sharing this tip. I tried it last year and worked beautifully. This year I tried it with grape tomatoes as I had about 300 unripe ones. Worked like a charm on them as well. Thanks, Kevin. I sure do love your site. A friend of mine told me how to do this several years back. But I had forgotten the banana trick. I have some tomatoes that are going to come into the house now! It’s so great to know that the hot high temps this year was the problem with the slow ripening of my tomatoes. I just thought I was doing something wrong this year. And the tip of bringing them in during growing season……fabulous! This is the first season that i grew a large garden of tomatoes because i have a small local market for my heirloom tomato seeds. i live in southwest Missouri where this summer was very hot and dry. In mid summer i had very few tomatoes but the foliage was so thick I couldn’t see very many. Then one day something ate all the leaves off my five foot high variegated. They looked like Christmas trees with red and green bulbs all over them. They did much better very quickly so i got busy and pruned all the shade leaves off my Missouri pink love-apples and suddenly they were producing thousands of big fat green tomatoes. Then an early freeze came and now i am stuck with over a hundred pounds of green tomatoes in all stages of development that I had to harvest and bring in. It took us three days just to clean them. What do i do with so many and will the seeds be mature enough to be viable? Hi Abe – I found your question posted under “Ask Kevin.” You’ll find a response there — and it’s good news for you. The tips in this article are great for green tomatoes, but in my experience, a tomato that is already partially ripe will finish ripening on the counter. My kitchen gets warm in the summer due to heat coming up from the basement, so that helps. One caveat is that plum-shaped or otherwise elongated fruit tend to leave a little bit of green shoulder — but they’re still perfectly usable. I like to bring in my fruit early (partially ripe, not green) for pretty much the same reason — so I don’t have to deal with any critters eating them. But once the chemical process of ripening is going on in the fruit, I’ve found they don’t need to be placed in bags. Kevin, any advice on keeping my Corgi out of my tomato beds? He hops right up into the raised bed and feasts on my cherry and grape tomatoes… aaarrrgggg! I am going to have to do this because of the darn squirrels, even though I spray them (the tomatoes) with hot pepper spray that I made. Kevin Very insightful information. You should run this column again! It’s getting really colder here in west central Indiana, and we just cut down our tomato plants yesterday, and have LOTS of green tomatoes. Probably 30 lbs of them. Right now, I’m heading to the store to buy some paper bags (It’s the local Save-A-Lot, where you can buy paper grocery bags for .15 each), and some more bananas. We did it this way last year, and it worked beautifully for us! Now it is nearly spring I start freezing washed banana skins and bagging egg shells. When preparing to plant our tomatoes near the end of May, I put the defrosted banana skins and eggshells through the blender with water to make a slurry. Digging a 5-6″ hole and pouring 1/4 cup of the slurry at the hole’s bottom, placing the seedling, covering by 3″ of soil, then another 1/2 cup or so of the slurry, finishing with compost after placing a halved, bottomless gallon jug so that 2″ of the jug remains above the soil. The halved jug protects from cutworm and keeps the water with the plant, not watering the surrounds encouraging weed growth. The banana provides potassium which is taken up more easily by the eggshell’s calcium. I often include coffee grinds for the earth worms. what about fruit that is nearly ripe ut would like to increase ripeness befor canning? Sunlight? shade? heat? Kevin, thanks for the great tips on how to ripen tomatoes indoors in a paper bag. I will be trying this out this summer, as soon as I see some green tomatoes in our garden. We have always had trouble with squirrels enjoying our tomatoes for their lunch, and of course they pick they best ripe ones. Hopefully by picking them sooner before they get ripe, we will save a bunch from being enjoyed by the little garden monsters. But if you ripen indoors, aren’t you missing out on nutrition and taste? WOW! I had no idea I could do this. Groovy! 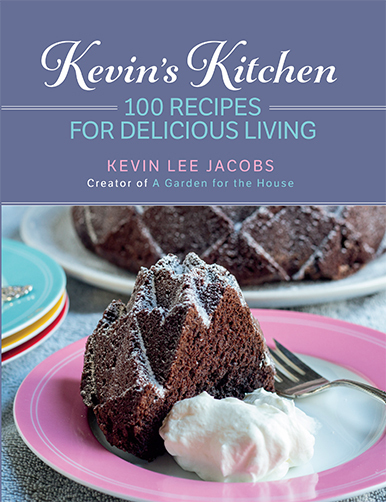 Thanks Kevin, I’ll be bringing a few in to try my hand at this. Love this! Plan to pick my mature size green tomatoes tonight. Okay so I am going to bring in a lot of tomatoes ASAP. I made the mistake of pruning off too many lower leaves to prevent viruses and got sun scalding on a few and I expect more to come. I’ll bring those lower fruits in and bag them. Thanks Kevin. There are some really good tips in these comments! Having only found this site recently, through a friend, I am SO wishing I’d known about it when we lived in the country! But now I’m in the city without so much land. Do you have something that can be done on a patio. I do like the raised deep planters, but do they do well with Heirloom tomatoes? If I remember correctly, those are do not have the cores. Right? Is it Big Boy or Better Boy that is without cores also? Do you think Heirloom beats those in beauty and flavor? This has been very helpful for me as a first year gardener! Thanks so much! I am doing mini cherry tomatoes in an aerogarden. Do these tips also apply to cherry tomatoes? Thank you. Eek I just picked all my green tomatoes before the frost hits,rinsed them and removed all stalks! Am I ruined?